The World of Chinese is a bi-monthly English magazine dedicated to Chinese language and culture. Our mission is to share stories that entertain, inform and connect the growing number of Chinese learners and people interested in China. Our content focuses on people, contemporary trends, history, customs, language learning and more. We share personal experiences, human interest and the lighter quirkier side of all things Chinese. Our cover stories focus interviews and in-depth report on China’s latest events and trends, striving to provide a comprehensive cultural background for language learners. Our travel features include visual stories as well as personal adventures from the distant mountain villages to the bustling cities. We publish original translations of some of the most brilliant contemporary Chinese writers for the world to enjoy. We also express environmental concerns in our green column, offer art, humor, food recipes and more. To facilitate language learning is always one of our biggest goals. Therefore, our feature articles are accompanied by fun and useful vocabulary section while language features provide handy speaking tips based on real-life cross-cultural scenarios. Regular columns present the old and modern with a fun twist and interactive, practical content for Chinese learners. 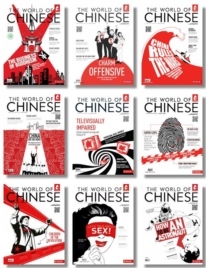 The aesthetic of the magazine strives for a balance between modern design and traditional Chinese elements, creating unique illustrations and page layouts worth pasting on your wall.We also run daily blogs on current events, travel guides, street smarts, comics, language pieces and etc. on our website: www.theworldofchinese.com.